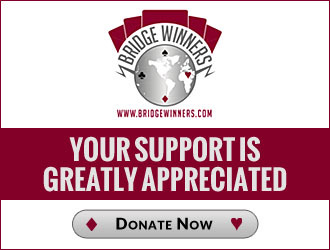 It's hard for me to believe, but I've been a professional bridge player and teacher for about 30 years. Along with Michael Rosenberg, our then 14-year-old son Kevin, and my mom, Judy Zuckerberg, in 2011 I moved from NY to the Bay Area of California. When not teaching bridge, I'm often enjoying hiking with new friends in this beautiful weather, while Michael stays home to write comments on Bridge Winners articles. While I've always enjoyed seeing young people learn bridge, in 2013 youth bridge become my passion. That year I became a mentor and organizer in the USBF Junior training program, and co-founded a youth bridge organization in the Bay Area, Silicon Valley Youth Bridge. Double dummy: What's the best lead?